Imagine if you could predict how a particular judge might rule on your summary judgment motion. Or if you knew which cases the judge found most persuasive so you could emphasize them in your memorandum? How would it affect your pretrial strategy if you knew your opponent’s motion might not get decided for six months? The answers to these and many other questions are waiting to be found in the growing body of data about judges that exists thanks to online decisions and dockets. The challenge is mining that data and extracting the information that lawyers need — or at least want — to know. Now several companies are aiming to meet that challenge. 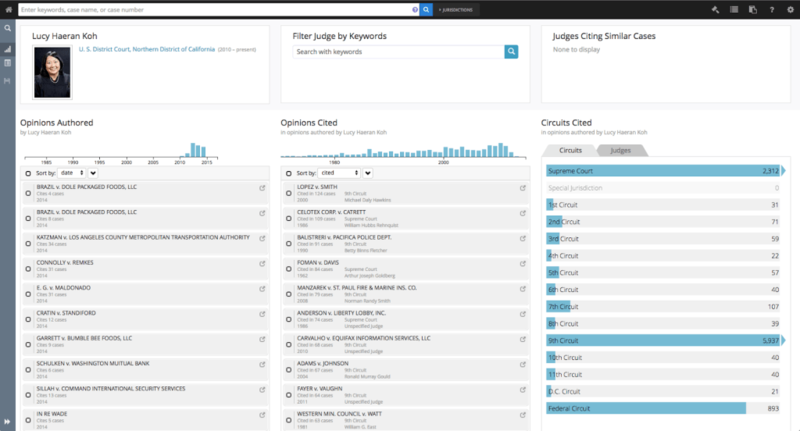 All of a sudden, it seems, judge analytics is the new black for litigators and legal research. At this week’s annual meeting of the American Association of Law Libraries in Philadelphia, at least three companies exhibiting there were touting their tools for judge analytics, and I know of one other exhibitor that has one in the works. It is a big data phenomenon. The quantity and variety of online information about and by judges reveals information about them that would have been virtually impossible to compile just a decade ago. This is not just your standard judges’ biographies and courtroom quirks. The promise here is of a deeper dive into their decision-making processes so that lawyers can better prepare their litigation strategies. How likely is a judge to grant or deny a specific motion? How long do cases take to terminate, get to trial, or get to the claim construction hearing before a judge? How likely is a judge to find patents, trademarks or copyrights infringed, invalid, or unenforceable? Brian Howard, a lawyer and data scientist at Lex Machina, recently told me that a user can build a list of cases according to virtually any criteria and then look at and filter the analytics for that list of cases. Get information about judges regarding caseloads, timing, damages, remedies and even how they handle specific violations. Ravel Law. Ravel Law’s Judge Analytics promises to provide litigators with “never-before-available information and analysis about how individual federal court judges make decisions.” It pulls together data on the cases a judge has authored and the cases a judge cites to, as well as an analysis of other judges who have influenced them and other jurisdictions they consider most persuasive. All of the opinions a judge has authored. All of the cases a judge has cited in those opinions. The frequency with which the judge cites specific circuits, judges and cases. How a judge applies the law in specific types of cases. How a judge relied on a specific cited case. Ravel also pulls together articles and blog posts discussing the judge. All of this information helps you better prepare to present a matter to that judge and to know which law is likely to be most persuasive. ALM’s judicial profiles include data on active and closed cases. ALM Judicial Profiles. The legal news and information company ALM has offered judicial profiles for several years but is now making a push to further build it out. 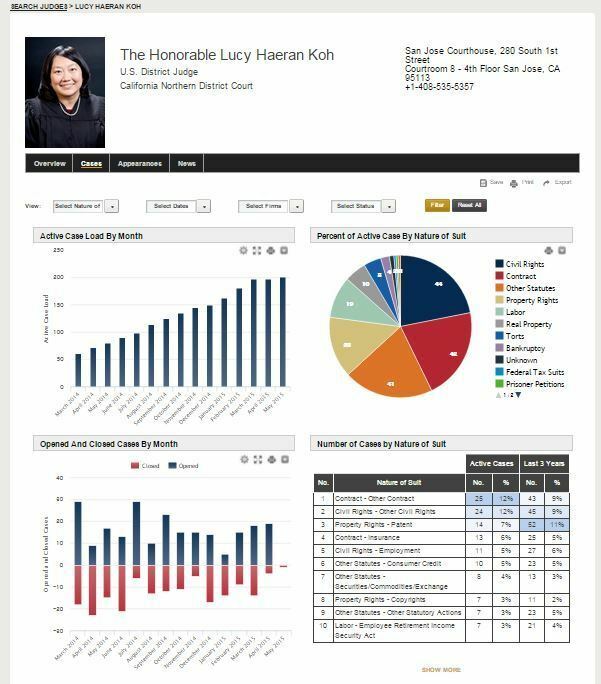 It provides access to judges’ case histories, biographical information and references in the news, and also lists lists lawyers and firms who have appeared before them in court. Case data, including data on active cases, opened cases and closed cases; cases by nature of suit; and specific details on active cases. The data can be filtered by nature of suit, data range, status and firms involved. Data on law firm appearances before the judge, showing the top firms and top attorneys and the cases they are involved in. The information can be filtered by nature of suit, date range and name of firm. Recent news stories mentioning the judge. ALM recently rehired Dirk Olin as director of judicial intelligence to build out this service. Olin was an editor with ALM until 2005, after which he was involved in several projects related to tracking and reporting on the judiciary. Among those he was founding director of the Institute for Judicial Studies and editor of JudicialReports.com, an online magazine covering the judiciary.